Last Thursday, the Climate Prediction Center, the long range weather forecasting division of the National Weather Service, made its prediction for this coming winter with a rather unusual statement. 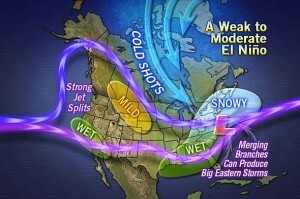 The El Niño event that had started to slowly develop and was expected to strengthen and influence weather patterns across our continent, suddenly vanished. (El Niño is a cyclical warming of the surface water in the western tropical Pacific Ocean and helps to establish a broad area of high pressure over this equatorial region which can greatly impact weather patterns over the U.S., especially in the northeast.) » Continue Reading. 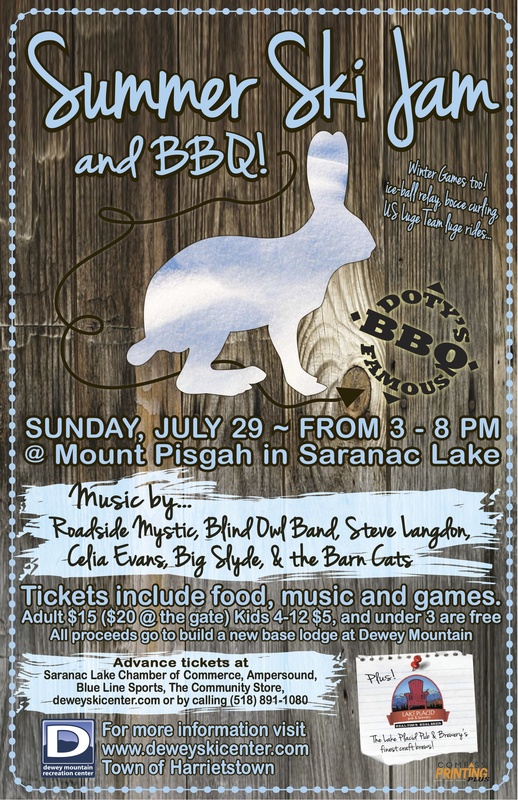 Two Saranac Lake institutions, Doty’s barbecue and the Dewey Mountain Ski Center, unite 3–8 p.m. Sunday, July 29 for a Summer Ski Jam & BBQ at Mount Pisgah. The idea of a Summer Ski Jam originated with some of the musicians who play Dewey Mountain Recreation Center’s little log cabin on winter Friday nights. They decided to get together in warm weather and put on an outdoor concert to benefit the campaign to build a new base lodge for Dewey Mountain. 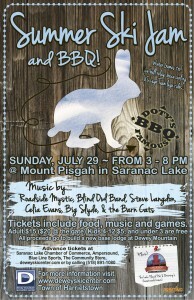 Performers include the Barn Cats, Big Slyde, Blind Owl Band, Celia Evans, Steve Langdon, and Roadside Mystic. The Summer Ski Jam & BBQ also features Doty’s signature marinated beef and chicken with all the sides. Together with his parents and brothers, Derek Doty ran the popular Doty’s Country Road Beef butcher shop for 28 years, and he continues to barbecue on special occasions. The community-supper atmosphere will welcome families as well as summer guests. » Continue Reading. The lowest point of Lost Brook Tract is about 3,300 feet above sea level. From there it rises along a steep ridge to a summit which tops out at 3,631 feet according to the United States Geological Survey which recently approved our proposal to formally name it. I have previously written about my exploration of the land leading to the summit and of eventually cutting a modest trail to it from the low point of our land where the lean-to is located. The trail I created winds along and across the glacial ridges that define our land, past outcroppings and rills and mossy glades to a flat rock protruding out from the top of the headwall. This spot has a jaw-dropping sixty mile vista we have named Amy’s Lookout. It is a few dozen feet below the true summit. » Continue Reading. I just returned from an impromptu March visit to Lost Brook Tract, having had a reason to come to New York State on business. Short but sweet, the visit began in winter and ended in spring. Given the winter weather the Adirondacks have had I was happy to encounter any significant snow at all. Accompanying me was my brother Michael. Michael is roughly my age and is actually my nephew but we call each other brothers; that’s the kind of relationship we have. .. and despite the tough slog in, still have, thankfully. We began the trip on a property owned by a friend where we are allowed to park our cars. We strapped our snowshoes to our packs as there was little more than a dusting. It was sunny and crystal clear but cool and crisp; the forecast had promised winter temperatures that day and night. » Continue Reading. Sometimes when the weather starts to fluctuate it is easier for someone else to plan the outdoor activities. A lot of times, attending these Adirondack Family events introduce us to a new area, new favorite trail or friend. This weekend is a typical Adirondack weekend where the choices are numerous. Unfortunately we can’t be everywhere at once. There are special family events happening in all corners and beyond the Adirondack Park. Here are four events that are free to attend. The Lake George Land Conservancy is hosting its Winter Warm Up on March 10 from 9:00 a.m. – 1:00 p.m. at the Lake George Recreation Center with a variety of activities from live raptor presentations to broomball matches. Up Yonda Farm will offer interpretive snowshoe walks. If you always wanted to try snowshoeing, this is your chance. The snowshoes are available to use for free as well. There will be nature crafts to make and storytelling by the bonfire. Hot soup, bread and s’mores will top it off. Also the Lake George Recreation Center has a sledding hill and cross-country trails. The LGRC’s Berry Pond Preserve can be accessed from the Rec Center if people want to venture out on their own. Dewey Mountain Ski Center in Saranac Lake is hosting its annual Dewey Day with Adirondack Lake & Trail Outfitters on March 10 (9:00 a.m. – 2:00 p.m. The facility will be free and open to the public. If your 6 to 13 year-old ever wanted to try biathlon, the Adirondack Paintball Biathlon is also on the roster. Other games include a children’s snowshoe scavenger hunt, icicle obstacle course and ski speed trap. 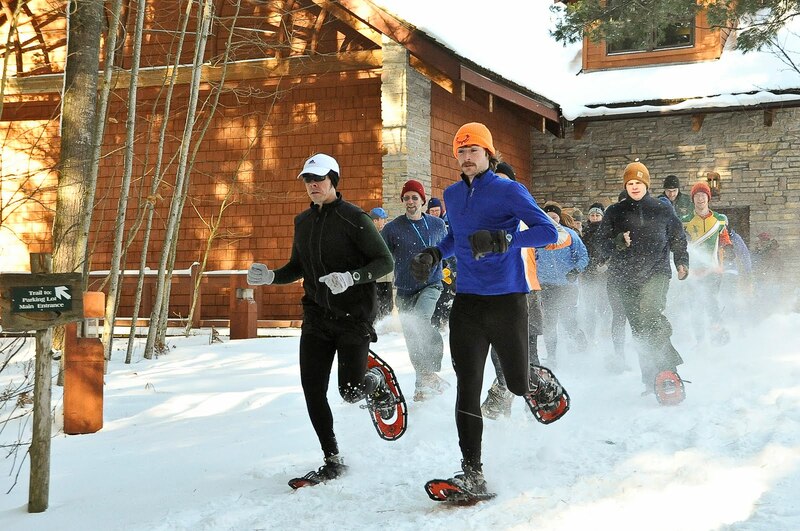 Bring a team for the boxer short triathlon relay where teams will ski, snowshoe and sled. In Newcomb the full moon will be celebrated at The Adirondack Interpretive Center (AIC) with a chili ski/snowshoe party on March 10th. The AIC’s trails usually close at dusk so these full moon parties are special indeed. The $5 fee covers the cost of the chili, hot chocolate and marshmallows. The trails at the AIC are always free and open to the public. This event is going to run no matter the weather so gear up. The event starts with chili at 6:00 p.m. and then closes with fireside hot chocolate and marshmallows at 8:00 p.m. 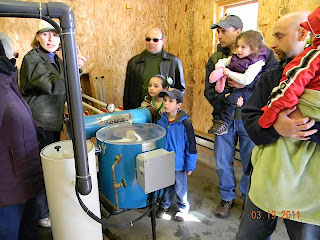 If you can stick around on March 10th, the 53rd annual Maple Party will start at 4:00p.m. ($) with live music, all-you-can-eat buffet and a tasty treat of Jackwax (maple sugar on snow). The Maple Sugar Party is not only a fun event but a fundraiser for the American Cancer Society. I realize there are plenty of other things happening around the Adirondacks but these four events are just a sampling that can get families outside and doing things together. How you spend your time together is important, I hope I made it a bit easier for you. Diane Chase is the author of Adirondack Family Time: Lake Placid and the High Peaks: Your Four-Seaosn Guide to Over 300 Activities. Her second Adirondack Family Time guide will be in stores this summer 2012. A living history event at Fort Ticonderoga highlighting Major Robert Rogers and the Battle of Snowshoes will be held on Saturday, March 10 from 10 am – 4 pm. Visitors will be able to encounter the French Garrison in the middle of winter inside Fort Ticonderoga and tour through opposing pickets of British rangers and French soldiers adapted to frontier, winter warfare. At 1 pm on Saturday, visitors will experience the hectic tree to tree fighting in a recreated battle during which the rangers make a stand against superior numbers, only to retreat through the deep woods. Visitors will be invited to tour Fort Ticonderoga as it appeared in the winter of 1758, meet the French and Indians who overwhelmed Roger’s experienced woodsmen, and see how native and French soldiers survived the deep winter at this remote military post. More adventurous visitors can take a hike led by a historic interpreter through the opposed pickets of soldiers in the deep woods. In these tours visitors can see how rangers kept a vigilant watch for subtle signs that might reveal their ferocious enemy. Re-enactors portraying French soldiers and native allies will live inside the period furnished barracks rooms of Fort Ticonderoga. They will recreate the winter garrison for Fort Carillon, as it was known until 1759. Just as in the March of 1758 these re-enactors will sortie out from the Fort to meet and overwhelm Roger’s men. Major Robert Rogers force of both volunteers from the 27th foot, and his own rangers headed out on an extended scout from Fort Edward along Lake George, following an attack on a similar patrol from Captain Israel Putnam’s Connecticut rangers. Hiking on snowshoes due to the three feet of snow, the tracks of Roger’s force were spotted on its march up the west side of Lake George. Near the north end of Lake George, Major Rogers, advanced scouts spotted their French counterparts. Rogers and his Rangers took up positions in a ravine, setting his force in ambuscade to await whatever French patrol would come to meet him. The French patrol that met Roger’s men proved far larger than he imagined, and in this Battle on Snowshoes, the rangers’ ambush was itself surrounded and overwhelmed. In deep woods on deep snow, the rangers were forced to retreat with heavy casualties as the French regulars, malice, and natives pressed home their attack. Despite stands along the way, this retreat quickly became chaotic as rangers, Roger’s included, ran for their lives from superior numbers of French. Illustration from Gary S Zaboly‘s “A True Ranger: The Life and Many Wars of Major Robert Rogers” (Garden City Park, NY: Royal Blockhouse, 2004). With all 28 trails open on its 287 acres, the New Land Trust (NLT) in Saranac is ready for their 2nd annual Chili Fest and Pot Luck on Saturday, February 18th. The Chili Fest and Potluck is termed as “super casual” where visitors come and share a noon meal and utilize the free trail system. There is an opportunity to compete in a chili cook-off and enjoy a bonfire that evening. Two dual-use trails, two information kiosks, a snowshoe-only trail, and a bridge on Nightrider are just some of the new improvements to enjoy. Yu encourages newcomers to use the upcoming Chili Fest as an introduction to the New Land Trust. Yu admits to seeing wild turkey as well as and the usual chickadees, woodpeckers, and occasional Ruffed Grouse as well as tracks from hare and deer while skiing the trails. Fundraising for this community-based project still continues for the Clubhouse roof but a newly donated woodstove and picnic area make the Clubhouse a cozy place to stop and relax. NLT has also found itself to be the recipient of various scouting projects. Most recently The Tree Trail Map was a Girl Scout project by Hannah Racette. The interpretive map starts at the Clubhouse building and identifies 14 different trees such as black cherry and quaking aspen and loops back to the Clubhouse. According to Yu the guide has proven to be a huge asset for school children having to complete Leaf Identification assignments. Visitors and naturalists will also find the Tree Trail Map beneficial. The New Land Trust is currently a volunteer-run 501(c)3 organization that was founded in 1977 by SUNY Plattsburgh students as an experiment in cooperative land management. It is easy to stay within the property boundary. The New Land Trust borders Stillman Brook to the west, the railroad tracks to the northeast and 37 Road to the east. If you need a chili recipe for the contest, here is a venison option by Adirondack Almanack contributor Annette Nielsen. Enjoy! 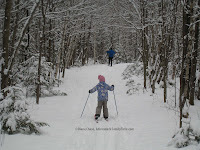 Photo: Skiing at New Land Trust, Saranac. Used with the permission of Diane Chase, Adirondack Family Time. Diane Chase is the author of Adirondack Family Time: Tri-Lakes and High Peaks: Your Four Season Guide to Over 300 Activities. Her second book on Family Activities is due out this summer 2012 for the Champlain Valley Region from Plattsburgh to Ticonderoga. 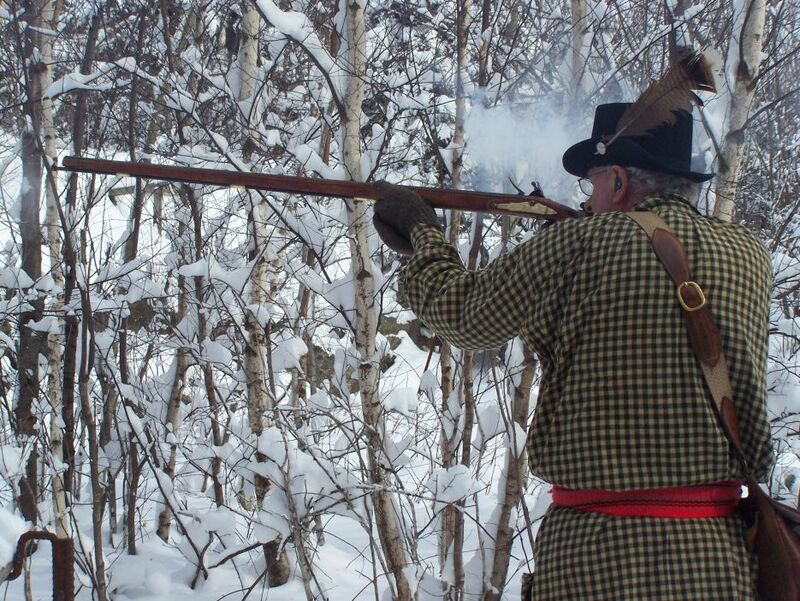 The St. Lawrence Valley Primitive Snowshoe Biathlon, organized by the Fort La Présentation Association and Forsyth’s Rifles and hosted by the Massena Rod & Gun Club, will be held March 3-4, 2012. Two of the three classes reflect the organizers’ mission to educate the public about the colonial and early American history of the St. Lawrence River Valley. In the first two classes, competitors using smoothbore muskets or rifles (flintlock or caplock) must cover the course on wooden snowshoes. In the third category, participants with in-line rifles may wear wooden or modern snowshoes. The advance registration fee is $20. Registration on the day of the event is $25. After paying the initial registration fee, a re-entry fee of $5.00 will be charged each time that a participant runs the course. Within the competitive classes, there are men’s, ladies’, and youth divisions. Awards will be presented to the top three participants in each division at a ceremony on Sunday afternoon. Participants are encouraged to wear historic clothes covering 1750 to 1812. Fort de la Présentation was one of a handful of French colonial forts in New York State. Forsyth’s Rifles from Ogdensburg re-enacts a U.S. Army regiment posted in Northern New York during the War of 1812. From the French and Indian War period, they portray a unit of French marines. Registration form and rules are at www.fort1749.org. Photo courtesy The Dalton gang Shooting Club of NH. The Lake George Land Conservancy (LGLC) is again hosting its free family event, the Winter Warm Up, March 10, 9 am to 1 pm at the Lake George Recreation Center in Lake George. This year’s event will include new live presentations and activities, including a live raptor presentation at 10 am by North Country Wild Care members Nancy Kimball and Wendy Hall; Mammals of the Adirondacks presentation at 11 am by DEC with animal pelts and bones; invasive forest pests educational table and presentation; interpretive snowshoe walks led by staff from Up Yonda Farm Environmental Education Center; family broomball at 10:30 and teens/adults broomball at noon (bring your own broom! ); door prize giveaways; and ongoing nature crafts, sledding, snowman building, storytelling and marshmallow-roasting by the bonfire. Breakfast goods will be available from 9 – 10 am and hot soups and bread donated by local restaurants and bakeries will be available from 11:30 am – 1 pm. Coffee, hot chocolate and ingredients for s’mores will be out all day. Participating businesses at time of this release include Rock Hill Bakehouse, Lake George Baking Company, and Bella’s Delicatessen. 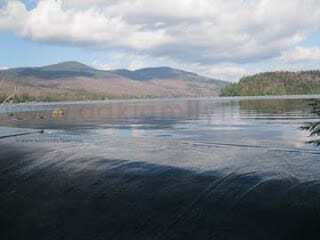 The Lake George Recreation Center’s trail system provides access to LGLC’s Berry Pond Preserve. Hikes onto the 1,436-acre Berry Pond Preserve will not be led during the Winter Warm Up, but guests are welcome to explore its trails on their own. Trail maps will be available. For more information contact Sarah Hoffman at 518-644-9673 or email shoffman@lglc.org. Founded in 1988, the Lake George Land Conservancy is a nonprofit land trust dedicated to working with willing landowners and other partners to protect the world-renowned water quality of Lake George and to permanently preserve the natural, scenic, historical and recreational resources of the Lake George region. Photo: A snowshoeing group from 2011’s Winter Warm Up (courtesy Jeremy Parnapy). Nordic skiers in the northern Adirondacks will want to keep Tupper Lake’s free, groomed cross-country trail system on their radar screen. Expected snowfall should have the 10k trail network skiable this weekend. The trails are located on town-owned land and can be accessed from the Tupper Lake Country Club or Big Tupper Ski Area. Even though the trail system has been in existence for 40 years, it’s something of a well-kept secret. “We’d like to change that,” says John Gillis, one of a half dozen community volunteers who maintain the trails in winter using snowmobiles and a variety of grooming and track-setting equipment. The trail system is free of charge, open to the public 24/7 (conditions permitting) and is dog-friendly. – February 4th, 6 pm: Full Moon ski and bonfire at the Cranberry Pond Picnic Area. – February 11th, 6 pm: Skiing with the Stars. If the night is clear a telescope will be set up. – February 18th, 10 am: Lumberjack Scramble Ski Race. – February 25th, 6 pm: Skiing with the Stars. If the night is clear a telescope will be set up. – March 2nd, 6 pm: Winterfest Bonfire at Cranberry Pond. Jeff Farbaniec is an avid telemark skier and a 46er who writes The Saratoga Skier & Hiker, a blog of his primarily Adirondack outdoor adventures. The Chili Ski and Snowshoe Fest will take place on January 28 no matter the weather conditions, according to Paul Smith’s College VIC Interpretive Naturalist Educator Sarah Keyes. The event will be jammed with family-friendly activities such as a modified “poker run” where kids will search on skis for animal cards and an obstacle course. There are also kids’ freestyle ski races, a bird walk and a snowshoe stampede. Keyes mentions that during the Christmas holiday she prepared weekday activities for school-aged children to get kids outside and entertained. The President’s weekend format will be similar and open to locals as well as visitors during holiday weekends. Keyes recommends people calling her at 327-6241 for more information. The Paul Smith’s College VIC Chili Ski and Snowshoe Fest will start at 10:00 a.m. with a bird walk with Adirondack Birding Center Director Brian McAllister and conclude with a backcountry ski lecture with Brian McDonnell of McDonnell’s Adirondack Challenges though the live music with the Bog Stompers and access to the VIC trails will continue until 4:00 p.m.
Diane Chase is the author of Adirondack Family Time: Tri-Lakes and High Peaks Your Guide to Over 300 activities. Her second book of family activities will cover the Adirondack Lake Champlain coast and in stores summer 2012. 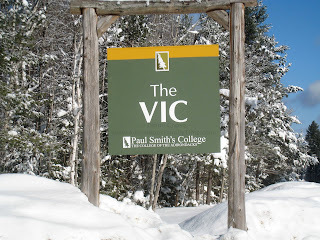 Cross-country skiers and snowshoers will have even more terrain to explore at the Paul Smith’s College VIC this winter. “We’ve made some significant upgrades,” said Brian McDonnell, the VIC’s director. “We’ve almost doubled the size of the trail system, and we now have trails to suit both classic and skate skiers.” A groomer purchased by Paul Smith’s College last winter will be used to maintain the expanded trail network. Since the college acquired the VIC from the state in January, it has made improvements to the building and grounds. 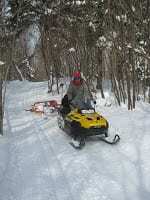 To help defray the cost of the trail improvements and the purchase of grooming equipment, VIC patrons will be required to purchase a day or season pass to the trails. Access to the VIC trails will remain free during the non-winter months. Three categories of trails, for snowshoeing, classic and skate skiing, will be maintained and marked for daily use from 9 a.m. to 5 p.m. Classic-ski trails will typically be groomed 4 feet wide with a track for both snowshoeing and classic skiing, while skating ski trails will be cut 7 to 10 feet wide and groomed to accommodate both skate and classic skiers. 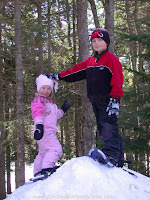 Snowshoe trails will be packed primarily for snowshoeing but may also be skied on when conditions permit. Some trails will also be designated for skijoring, or dog-drawn skiing. Leashed dogs are allowed on the snowshoe trails at anytime, as well. Trail users will be asked to register at the visitor’s building. Trails will be monitored by a trained volunteer first-aid ski patrol, and a courtesy patrol to assist people with directions. McDonnell said the trail network is likely to be expanded next year. The VIC staff has scouted a network of potential trails that could be added to the nature center, which covers nearly 3,000 acres. “This is a transitional year, and future expansion will depend on how much interest we have from the community for the varied ski-trail network,” McDonnell said. Guest pass: Add an additional $25 to any season pass and bring a guest. Additionally, the VIC will rent cross-country skis for $25 a day and snowshoes for $15. Trail fees will be included in the cost of the rental. 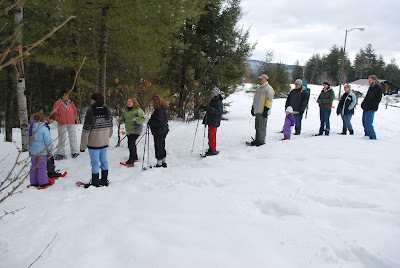 Trail pass holders will be eligible for discounts on weekend events and program at the VIC, including bird watching walks; natural-history themed walks and events; and backcountry snowshoeing led by VIC staff up the Adirondack Low Peaks. Several other weekend programs are in the works. For more information, call the Paul Smith’s College VIC at (518) 327-6241. Photo: The pack sprints from the starting line during a snowshoe race at the Paul Smith’s College VIC (photo provided). Though there are many places to enjoy throughout the Adirondack Park, the small village trails are often the sweetest treat for families with young kids or anyone just wanting to stretch his/her legs. The Brewster Peninsula Nature Trails in Lake Placid are situated on a parcel of 133 acres of land purchased by New York State in 1960. 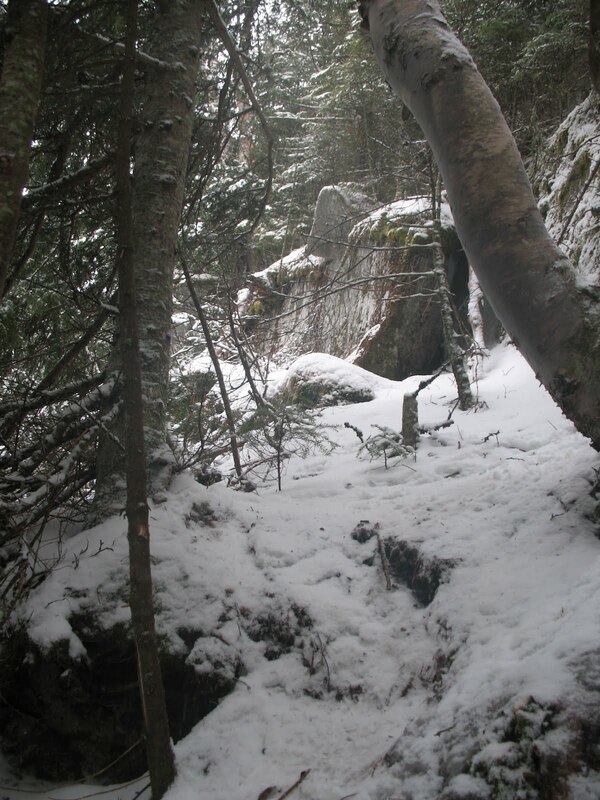 According to the self-guiding pamphlet produced by The Garden Club of Lake Placid (with help from the Adirondack Ski Touring Council and the NYS DEC, the Brewster Peninsula trails were heavily logged in the 1940s with the exclusion of a small 200′ strip of untouched lakeshore. 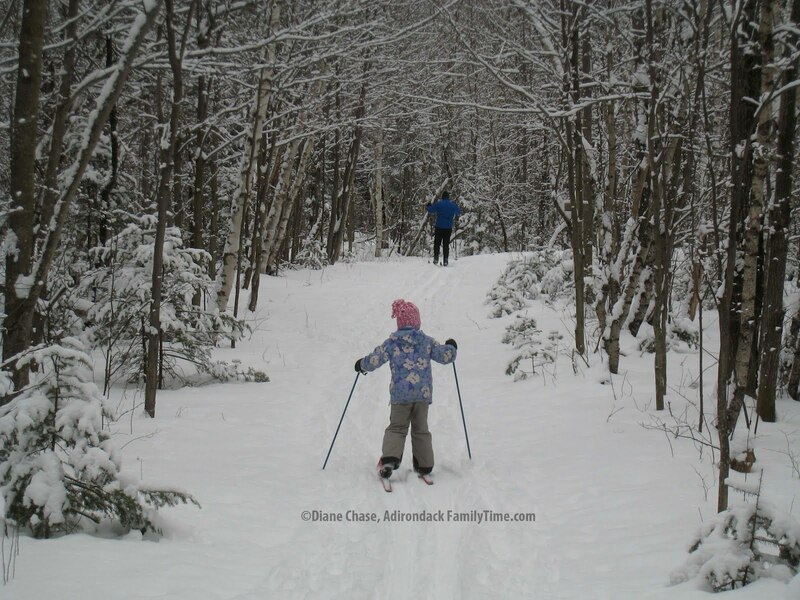 Our main purpose for being in Lake Placid is to shop but with all the holiday craziness we need to get outside so we are taking the snow pants, boots and coats for a stroll around one of the Brewster Peninsula trails. The ground is hard and not much snow but we just need some fresh air. When we arrive we diplomatically choose one of the three trails; Lakeshore (0.8 mile loop, Boundary (0.9 mile loop) or Ridge (rock, paper, scissors). We go the Ridge Trail. The Ridge Trail is the longest trail at a 1.3-mile loop. We pass the entrance gate and watch for signs to the right. The main path is the old logging road. It is a wide, relatively smooth dirt road. The legs of my daughter’s snow pants are rubbing together reminiscent of corduroys squeaking. She informs me that they are talking to her. I ask what they say and she replies, “They want me to run.” We oblige. My son sword-fights with tree branches that have the audacity to be in his path. The trees retaliate by dumping melting snow down his back. The path is a gentle incline and the new boots seem to up to the task. One short, more popular path, is the Boundary Trail. This 0.9 loop trail intersects with the popular Jackrabbit Trail and leads directly to the west side of Lake Placid lake. This trail also leads to the Shore Owner’s Association (SOA) dam. Along that path are wooded footpaths, roots to explore and a beautiful view of the lake. Look for interpretive signs along the way (designed by Adirondack artist, Sheri Amsel) as well as benches in case members of your party need a moment of solitude. Enjoy these trails all year long on foot, snowshoes or cross-country skies. From Saranac Ave (Route 86) in Lake Placid, turn onto Peninsula Way, between Howard Johnson’s Restaurant and the Comfort Inn and drive about 0.4 mile. Follow signs for Brewster Peninsula. Parking and entrance gate is to the left. Trail maps are available at the trailhead. Photo from the dam at Brewster Peninsula used with permission of Diane Chase, the author of Adirondack Family Time: Tri-Lakes and High Peaks: Your Four-Season Guide to Over 300 Activities(with GPS Coordinates), covering the towns of Lake Placid, Saranac Lake, Tupper Lake, Keene/Keene Valley, Jay/Upper Jay and Wilmington. Diane next guidebook of Adirondack Family Activities in this four-book series will cover the Adirondack Coast from Plattsburgh to Ticonderoga. Though chances of snow in the Adirondacks for this weekend looks to be slim, the Adirondack Interpretive Center in Newcomb will still hold its first Full Moon Ski/Snowshoe and Chili party on Saturday, December 10 starting at 6:00 p.m. According to Program Director Rebecca Oyer the focus of the event is to get people outside so if the snow isn’t available for this first event, the trails will be open to families and guests for a moonlit hike. 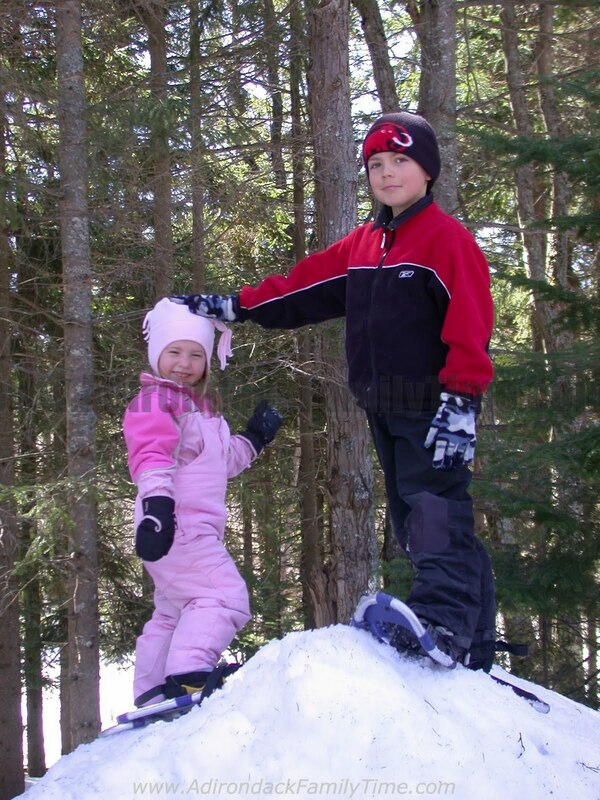 Oyer encourages families to try snowshoeing around the Newcomb facility when the snow does come because it is a free opportunity to try the sport. She wants to remind people that snowshoes or skis are required on the Newcomb trails when there is snow. Oyer says after the quick orientation participants are encouraged to go out and enjoy the 3.6 miles of trails on their own. Then people will return by 7:00 p.m. for fireside hot chocolate and roasted marshmallows. There will be full moon events each month through March. The cost for each event is $5.00 per person, which covers the cost of the food. 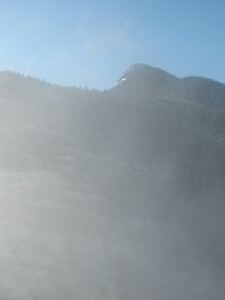 The other full moon Chili and Full Moon Ski/Snowshoe dates are January 7, February 4 and March 10 so mark your calendar. Rebecca Oyer at the Adirondack Interpretive Center can be reached at 518-582-2000. Diane Chase is the author of Adirondack Family Time: Tri-Lakes and High Peaks (Your Four-Season Guide to Over 300 Activities) available online or bookstores/museums. Diane’s second guidebook, Adirondack Family Time from Plattsburgh to Ticonderoga, in the four-book series of Adirondack Family Activities will be stores summer 2012. This afternoon I took my regular lunchtime hike up Baker Mountain outside Saranac Lake. The trail is a mix of frozen turf, hard snow, and glare ice. I imagine most trails in the region are in similar shape. This is a good time to invest in a pair of Microspikes. These lightweight mini-crampons are perfect for hiking on trails in early spring, when there isn’t enough powder to warrant snowshoes and where regular crampons would be overkill. Made by Kahtoola, Micropikes weigh just 11.4 to 15.6 ounces, depending on which of the four sizes you buy. They consist of a tough elastic band (red or black) attached to a steel chain with small steel spikes. Just stretch the band over your boot and go. Microspikes are compact enough that you can easily carry them in your pack until they’re needed. They sell for $59.95 (stuff sack is $10 extra). I’ve been impressed with how well the spikes grip even in hard ice on steep slopes. On my trips up Baker, I often pass hikers struggling up the slippery trail without traction. But I also see more and more hikers wearing Microspikes. Apparently, I am not the only one impressed with their effectiveness. 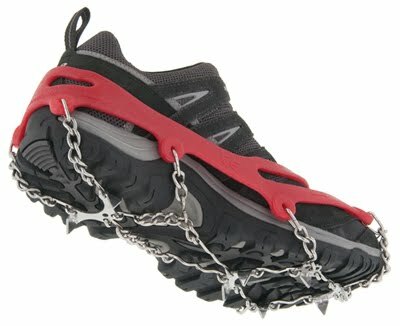 I do have one complaint: Microspikes don’t fit well over telemark boots, but this is not a flaw that will concern hikers. Another worthy piece of shoulder-season gear is the NRS Wetsock, a neoprene bootie that can be worn with sandals, wet shoes, or whatever else you put on your feet while paddling. They’re great for keeping your feet warm on those early-spring trips when you find yourself stepping into frigid water. Recently, I read a post from a backcountry skier who carries Wetsocks in her ski pack for emergency use in the event her regular socks get wet. This hadn’t occurred to me, but I’ll be carrying mine in my ski pack from now on.